Wife of archterrorist Marwan Barghouti calls on Pope Francis to intervene in terrorist hunger strike. Fadwa Barghouti, the wife of archterrorist Marwan Barghouti who is leading a hunger strike by terrorists in Israeli prisons, on Wednesday wrote to Pope Francis calling on him to intervene and stop the hunger strike "before it is too late". 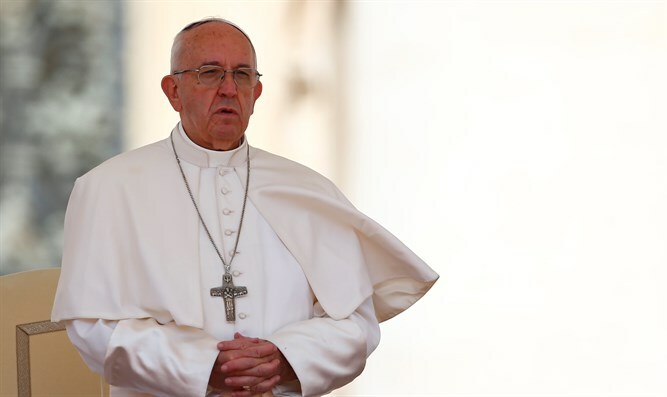 In her letter, Barghouti called on the Pope to "speak up, because freedom and dignity are God given rights, and no human group should deprive another of these rights." "Your call for respect of the rights of the Palestinian people, including the rights of our political prisoners, would allow the voice of those placed in isolation to reach the world," the letter says, according to the AFP news agency. Barghouti, who is serving five life sentences in Israel for his role in terrorist attacks during the second intifada, began the hunger strike on April 17. Since then, however, it has since showed signs of weakening. Earlier this week, Israeli police released a video showing Barghouti secretly breaking his fast. Jailed terrorists have often used hunger strikes as a pressure tactic aimed at forcing Israel to improve the conditions of their imprisonment or release them out of fear for their lives. Israel has several times in the past caved to the pressure and released some hunger strikers. This time, Israel has vowed not to negotiate with the hunger strikers, with Public Security Minister Gilad Erdan calling them "terrorists and incarcerated murderers." In her letter, Fadwa Barghouti said "the Israeli courts are instruments of oppression not justice, especially Israeli military courts with their conviction rate of 90 percent to 99 percent for Palestinians." The Vatican recognized “Palestine” as a state several years ago. Earlier this year the Palestinian Authority opened an embassy in the Vatican.